As the dark days of winter draw near, December’s Querent, who we will call Milton, is seeking personal enlightenment. He writes that he has always had a fascination with the supernatural and wants to know if he will ever have an experience that will prove with certainty that supernatural phenomenon exists and if possible when this will occur. Fascinating question Milton! The three card reading resulted in the drawing of the Moon, numbered 18, the Ace of Pentacles, and the reversed King of Cups. The Moon is a Major Arcana card, which means it holds significance for Milton’s life path and personal development. It is no surprise that such a card arises in this reading as Milton is asking a question of value to his spiritual and personal growth. He is asking about a matter of belief, or more specifically of confirmation of beliefs. 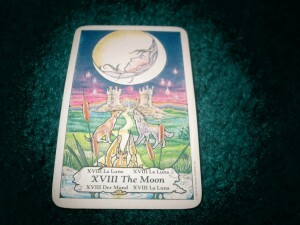 The Moon card deals with matters of the subconscious, unconscious, and intuition. On a gut level, Milton senses there is more out there than meets the eye. In particular the Moon depicts that which is often clearer in the dark, when the distraction of daylight is no longer present. Milton’s past experiences and interest in the supernatural are likely to stem from experiences that triggered his own psychic intuition, and served as an internal guide in times of darkness- both literally and symbolically. Experiences with phenomenon including astral travel, déjà vu, astrological or UFO phenomena and precognitive or instructive dreams are likely to have taken place before. Likewise phenomena that prompts attention to the subconscious and psychic realms but in a way that is subtle, behind the scenes- a slight nudging rather than a neon sign. These experiences likely triggered the subconscious to pay attention, something special was occurring, but existed in just enough subtlety for the conscious mind to doubt, analyze or rationalize. The realm of the Moon is the realm of symbolism, instinct and magnetic attraction of situations and conditions that stand to teach one if one is receptive and open. It is however a shadowed realm, it is one that requires an individual to connect the dots, draw their own conclusions slowly over time, and trust their intuition rather than reacting to their emotions- especially fear and doubt. It is also a realm of illusion. The light of the Moon is reflected and therefore transmits light from another source- but shadows can play tricks with the eyes. It is possible that past supernatural encounters occurred that drew on the experience of others or required research or networking with others for confirmation, but that this confirmation or even shared experience still left room for multiple explanations or possible doubts. In regards to finding proof of the supernatural- the Moon would likely indicate phenomenon related to the sky, psychic intuition or psychic dreams, experiences related to UFOs but that requires patience, instinct, and receptivity as the Moon does not deliver a solid message all at once but gradually nurtures a series of clues that unfold cyclically over time. It is likely however that experiences related to dreams, nocturnal experiences, and perhaps involving the sky such as UFO sightings have been brought to Milton’s awareness and maybe even personal experience- but with enough room for the conscious mind to bring doubt or question the receptivity of the subconscious to such phenomenon. Milton should try to remain open- view these past experiences like clues on a lifelong mission to uncover hidden esoteric realities. The next card is the Ace of Pentacles. This is a card of mundane matters but also of tangibility and practicality. It is very different from the Moon card as the Ace of Pentacles shows physical attainment and tangible proof. There will be or perhaps has already begun to be- an experience related to the physical body, physical sensations or material property that will help to confirm beliefs in the supernatural. This is likely to relate in some way to your work or money as the Pentacles often relate to one’s resources or valuables. The material feeling of the Pentacles also describes this as an event that brings proof that Milton will be able to touch or see manifest in the physical. This card not only shows Milton receiving physical or tangible evidence he has sought for his belief in the supernatural, but is also an indicator of a quest fulfilled. A physical manifestation brings the answer to the question and confirmation that a desire dreamed about or wished for will materialize. This evidence may impact his physical body, material goods or property as well. The following card is the King of Cups, and it is reversed. It is likely that the evidence Milton seeks will evolve from a trying time involving the well being either of himself or of a man he looks to as a father figure or nurturing male authority figure. A challenge to the emotional well being brings a quest that is not primarily supernatural, but a quest for emotional healing and restoration of emotional balance. It is through this difficult time that emotional security will be challenged but enlightenment and conviction in beliefs in the paranormal will come to be expressed. Some type of extraordinary communication or intuitive connection made with another- possibly a male family member, father, or father figure- likely brings this confirmation but the reversal suggests that this is not immediately felt as an accomplishment in Milton’s search for proof of the supernatural, but rather is initially felt as a loss, and an emotionally upsetting or unsettling experience. This will be an experience likely to reach Milton on an emotional level and may challenge the feeling of emotional control or empowerment at first. Part of this experience will involve a challenge to bring renewed emotional security and healing. When Court cards appear it is often an indicator of traits within the Querent’s personality but may also be mirrored through experiences impacting others close to the Querent. In this case a challenge faced by the father or a paternal nurturing figure will have an impact on Milton causing him to come to closer terms with his own emotional vulnerability and seek healing and a different perspective, this is an opportunity for Milton himself to grow in emotional empowerment and stability by experiencing this process. For the portion of the question asking about timing, this is a common question in Tarot inquiries that can be difficult to judge. The initial card being the Moon card suggests some experiences have already occurred that are of significance and may have even occurred repeatedly on some type of patterned basis. 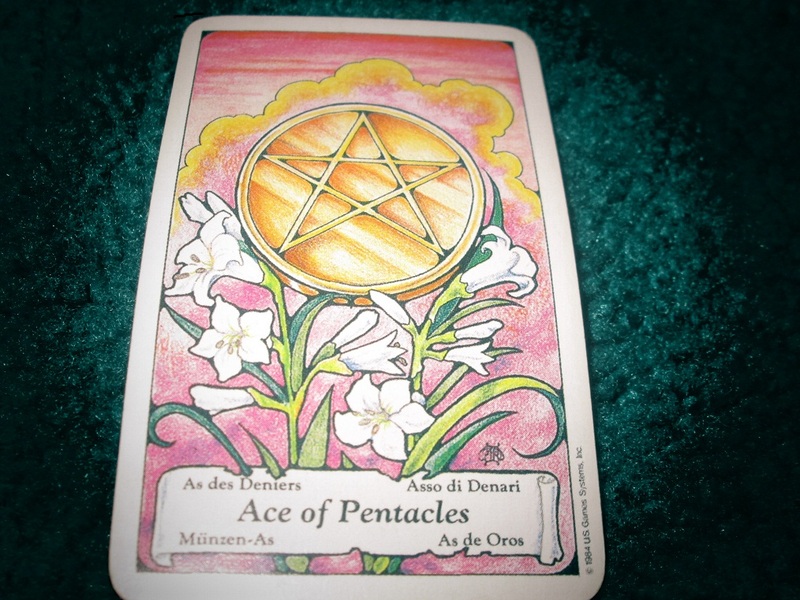 The Ace of Pentacles indicates harvest and therefore align this event with the fall or a time of great material abundance that Milton will experience. As a side note unless a reading is intended to cover a specific time period i.e. “in the next month what will happen in my workplace”, it is useful to take the information from the reading as guidance and avoid narrowing one’s vision down to a specific date. 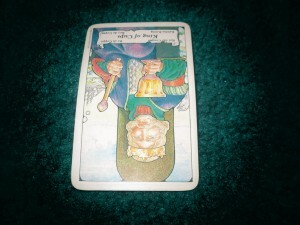 For some patterns reflected in a Tarot reading are emerging based on the Querent’s actions and so if first a Querent is going to move, and then by moving be connected with a potential lover, the date on which the move occurs may not be as substantial in the larger picture than the act of moving itself. Also when individuals become aware of a date it can become a distraction- if one is regarding “May 3rd” as the date on which they will fall in love, they may then be so fixated on every person they meet that day being “the one” that they don’t allow processes to unfold naturally that would bring the individual to the right place and time to connect with their future significant other. As a general guideline it is best to consider time frames with as much detachment as possible, as things the conscious mind will try to prompt one to do to avoid/hasten an event can cause confusion when it comes to reaching one’s goal on a timeline anticipated ahead of time. In general from this reading, this is an event that would likely occur in the fall, and on the 1st (Ace) 18th (Moon) or 9th (1+8) day of the month, but in what proximity to the present is difficult to ascertain with Tarot. Best of luck to Milton in his quest for enlightenment, and thanks for participating in this month’s column! As always, no matter where you are reading this from all readings are for entertainment only in accordance with New York State law. To the reading audience, thank you again for your readership and have a happy, safe and spiritually fulfilling holiday season. About Angela: Angela Kaufman has been exploring divination through Tarot cards over a decade. She is a Certified Professional Tarot Reader and formed Moonlight Tarot in 2009 which would become Moonlight Tarot LLC in 2010. Angela uses the Tarot to assist clients in exploring personal growth and development, and in accordance with New York State Law offers readings for entertainment purposes. Angela began providing readings on a professional, “Moonlighting” basis in order to provide affordable readings to those seeking guidance, inspiration and fun. Angela is also co-author of the new book “Wicca, What’s the Real Deal? Breaking Through the Misconceptions.” (Schiffer Publishing, 2011). In 2006 she joined ISIS Paranormal Investigations and has accompanied the team on numerous investigations in private residences and businesses throughout the capital region, Adirondacks, Vermont and Massachusetts.